There are loads of great things to do with children in Jersey - and they don't all cost money. If you're looking for ideas you're in the right place. It is possible to spend a lot of money going round all the attractions - but there are lots of free things you can do. There are plenty of parks and playgrounds for children in Jersey. Elephant Park at St Brelade is an old favourite - remember to take the buckets and spades with you. Also in St Brelade, there is a playground at Les Quennevais Sports Centre. Millbrook Park has two large playgrounds and a paddling pool. St Andrew's Park at First Tower has a large area of grass great for kicking a ball around as well as play equipment. In St Helier there is a small playground for toddlers in the Howard Davis Park, and another for slightly older children in the Parade Gardens. There is a playground on South Hill near Fort Regent, and another in the People's Park, also good for football. There is a small playground near the car park for Longbeach in Grouville Bay. There are many pubs and even some restaurants which have indoor or outdoor play areas. The Departure lounge at the Airport has a soft-play toddler area. The water-maze near Le Fregate Cafe on the Waterfront in St Helier is a favourite with children in Jersey on a hot day. Take a towel and costume or change of clothes though. Jersey's beaches are like one huge adventure playground! Even in the winter, young children enjoy digging in the sand and exploring the rock pools. Or how about collecting shells or driftwood? There are some great walks suitable for families with children in Jersey. My favourite is St Catherine's Woods because of the stepping stones and rope swings. The Railway Walk is good if you need to take a pushchair or pram. 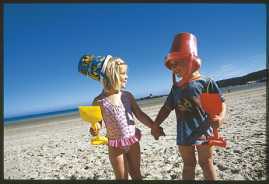 Jersey is also a great place to try out the family-friendly GPS treasure hunting game called Geocaching. At the South end of the sand dunes in St Ouen's Bay, there are a couple of places where you can slide down the sandy hollows on a simple plastic sledge. 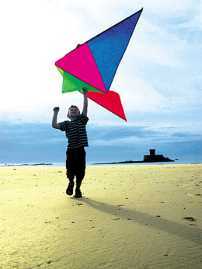 St Ouen's Bay and St Aubin's Bay are good for kite flying when there is a breeze. Some sections of the cycle track along the St Aubin's bay promenade are good for roller-blading. Park at First Tower ( the 4th layby car park going west out of town) and then head west along the promenade - the section to the east is rough and unpleasant to blade on. If you stick to the cycle tracks, Railway Walk and Green Lanes, there is plenty of safe cycling suitable for children in Jersey. Stay away from the busier roads - they can be scary even for adults! If you're in Town with children, pop into the Central Market to see the fish in the fountain, or the Beresford Market to see the tanks of live lobsters and crabs behind the fish counters. Watch out for Street Theatre performances and buskers around town. There are also events on the stage in Howard Davis park which are free, or there is sometimes a small charge if you want to sit on the chairs. Some of these are shows specially for children. Check the notice board at the main entrance to the park. Most weekends there are fetes taking place around the Island. Some charge admission, some are free. There is often an arena with a program of entertainment throughout the day - anything from martial arts to dog agility displays. The Lion Park in St Lawrence is part of the Jersey Goldsmiths complex. Admission to the park is free, and you can watch for Red Squirrels, see the flamingos or watch the model boats on the lake. As with most attractions though, there are plenty of paying activities, so it isn't that easy to have a free afternoon out! Admission to Fort Regent Leisure Centre is free, but you pay for activities. There is a large, supervised indoor play area for younger children, and lots of sports facilities. Samarès Manor charges admission, but there is a huge area for children to run around in as well as a small playground. If the weather is bad there is still plenty to do with children in Jersey. You could visit one of the indoor Swimming pools, go to the cinema, or play ten-pin bowling at Jersey Bowl. They also have a large indoor play area and Quasar. The Maritime Museum is an award-winning interactive museum which will keep the children happily occupied for hours. Tip Watch out for Flash Days at the Jersey Heritage Trust sites (Castles, Museums and Hougue Bie.) These run throughout the year. Each Flash Day has a theme, and there will be lots of activities for children to take part in. Check their website to see when they're happening. For many families a visit to the Durrell Wildlife Conservation Trust (Jersey Zoo) is an essential place to take children in Jersey. It's an expensive day out, but the enclosures are designed to be as natural as possible, and some of the animals live free in the grounds. Tip The zoo is large, and there is a lot of walking involved, so you might want to take a pushchair or backpack for younger children in case they get tired. The attraction that I think offers the best value for money and range of activities for children in Jersey is the aMaizin maze. You can easily spend the whole day here, there is so much to do. The activities have been chosen by people who really understand what children enjoy. They change slightly every year, but always include a variety of go-karts, tractor-rides and a water pistol range. The activities in the adventure park area are all included in the admission price, which is very reasonable. Choose a day when the weather is good - almost all of the activities are outdoor. Tip Take a towel, costume and at least one change of clothes for each child! The water-pistol area is so popular that children want to go back in again and again - soaking each other with the hoses. Tip Take a picnic. There is a fast food cafe on site but the range of food is rather limited - burgers and chips mostly! The Living Legend has two fun minature golf courses on and around a huge man-made rocky hill. The go-carts there are popular too. Top of 'Stuff to do with children in Jersey'.